Just six years after the Wright Brother’s first successful powered flight in Ohio, the Islamic State (Uthmani Khilafah) became one of the first nations in the world to start a military aviation program. Impressive as it may seem that Muslims quickly adopted this technology, the precedence to acquire new techniques and technologies for the protection of the Islamic State and its expansion was shown by the Prophet (saaw) himself. In his Tarikh (History), At-Tabari reports that the Prophet (saaww) had sent two of his companions, ‘Urwah Ibn Mas’ud and Ghitan ibn Salmah, to the city of Jarash in Syria to learn the techniques of manufacturing Dababas (tank like weapons), Manjaniq (catapult) and Dhabur (similar to tanks). These were weapons used by the Romans of the time. The Seerah of the Prophet (PBUH) offers many more examples such as the use of Persian style trenches in the battle of Khandaq and the expedition sent to Yemen to learn the art of making and using catapults. The Islamic State followed this Sunnah of the Prophet (saaw) even when it was leading the world in technology. When the technologies of powered flight and weapons for aerial attack were developed, the Islamic State wasted no time in acquiring these technologies for its own use. The history of aviation is no different from the history of other sciences and technologies in that the development of aviation lies in a long, rich history where small advancements took place over many millennia, and development didn’t just happen in the few years prior to the first powered flight. Many ancient civilizations produced projectile weapons, flying devices, and designs for human flight – many impractical but some practical. Some examples include the tale of the mechanical pigeon of Archytas from ancient Greece, the sky lantern (hot air balloon lanterns) from China, and the first rocket weapons which the Chinese used against the Mongols. It has been reported by the 11th century Hijri historian Ahmed Mohammed al-Maqqari that in the 3rd century Hijri, Abbas ibn Firnas was the first to achieve winged flight by gliding using a winged contraption of his own design. The modern era of aviation was ushered in with the advent of the Industrial Revolution in Europe. Many great advancements in powered flight occurred in the 1800s in Europe resulting in successful, powered flights. Building on the works of their predecessors and contemporaries, the Wright Brother’s solved the problems of power and control and made their historic flight in 1903. Very soon afterwards, England, France, US, Germany, Russia, and Italy, started their military aviation programs, and the Islamic State joined them with an aviation program of its own (Osmanlı Hava Kuvvetleri). Military attaches from the Islamic State staying in European capitals studied the development of military air craft in Europe, and very soon in 1909 military officials of the Uthmani Khilafah invited French aviators to Istanbul to perform demonstrations. The Belgian pilot Baron de Catters came to Istanbul and performed an exhibition flight with his Voisin biplane upon the invitation of the Minister of War Mahmut Şevket Paşa. As a direct consequence of this demonstration, awareness and interest in military aviation was greatly increased in the Islamic State. Officials sent a delegation to the International Aviation Conference in Paris. In 1910 Muslims candidates were sent to Europe to be trained as pilots, however financial issues within the state caused this plan to be postponed. Nonetheless a few pilots were still trained in flight schools in Paris and gained their flight certificates. The Military officials in the Uthmani Khilafah were keenly aware of the arms race brewing amongst the nations of Europe to strengthen air forces and the importance that these air forces would have on the future of warfare. In order not be caught off guard or left behind, the Minister of War Mahmut Şevket Paşa appointed Lieutenant Colonel Süreyya Bey in 1911 to procure balloons, to head the construction of aviation facilities, and to organize the training of pilots. Under the Scientific Research Unit of the Ministry of War, the Aviation Commission was established. In addition to the task assigned to it by Mahmut Şevket Paşa, this commission also engaged in intelligence and strategic information gathering. Studies were done not only on aircraft but also on anti-aircraft weaponry. This proved to be most useful in the war to come with Italy. In 1911, Italy invaded part of the Islamic State in what is now modern day Libya. The fledgling air force of the Uthmani Khilafah was not yet ready to employ military air craft. Attempts to purchase air craft from France and send them via-Algeria to the battlefield were not able to be materialized. With an air force of 28 aircrafts and 4 balloons, Italy became the first nation in history to employ an air force in war. With its development in anti-aircraft weaponry, the Islamic State then became the first nation in history to employ anti-aircraft weaponry in war. The Muslim army successfully downed balloons and other military aircraft from Italy and even captured some planes. 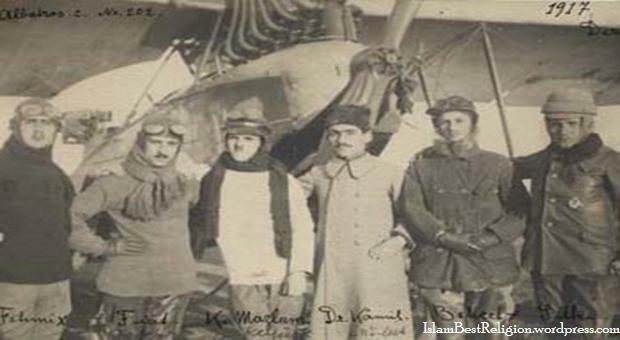 In 1912, the first military pilots of the Islamic State, Captain Fesa Bey and Lieutenant Yusuf Kenan Bey completed their training in France and returned home. They were given 2 of the 15 airplanes bought through public funding. On April 27, 1912 Fesa Bey and Yusuf Kenan Bey flew over Istanbul becoming the first Muslim pilots to fly the first Muslim air craft over Muslim lands. Shortly afterwards in July of 1912, a Flight Training School was opened in Yeşilköy, a suburb of Istanbul, so that the Islamic State could train its own pilots. This marked an important step for the Islamic State from dependence on foreign countries. Quickly the number of pilots increased to 18 and the number of aircraft to 17. This was soon put to the test when the semi-autonomous regions in the Balkans rebelled against the Uthmani Khilafah and declared war against the Islamic State. The air force did not play a critical role in the initial stage of this conflict, but in the second phase of the war, 9 fighter aircraft and 4 training aircraft performed an important function. To demonstrate the prowess of its air force and to create enthusiasm in the citizens of the state, military officials of the Uthmani Khilafah organized several long distance flights. This also improved the capabilities of the air force in performing long flights and bringing protection to the vastness of the whole state. The first long distance flight was flown from Edirne to Istanbul and took over 3 hours. On November 30, 1913, Belkıs Şevket Hanım became the first Muslim woman to fly. In response to applause given to French pilots who flew from Paris to Cairo, the state organized an expedition in 1914 to cover a distance of nearly 1500 miles from Istanbul to Alexandria. Due to the dangers of aviation in these early stages of the technology, two of these expeditions resulted in crashes, but the third one succeeded. When the Uthmani Khilafah was drawn into World War I, it had only 7 aircraft and 10 pilots. With the determination and the diligence of its ministers and the help of its new ally in Germany, the air force grew to 46 pilots, 59 observers, 3 observation balloons, 92 aircrafts (including 14 seaplanes), and a backup of 13 pilot and 22 observer trainees and 21 training aircraft. As the war progressed, the Muslims even attempted to increase these numbers by capturing British aircraft. During the course of the war, a total of 450 aircrafts were used, flown by 100 Turkish and 150 German pilots. The air force is but one testament as to how relevant and aware the Islamic State remained even at the very end of its days. Such is the legacy the Islamic State left for the Muslims of the world. It remained sincere to Islam and Muslims, and it protected the lives and the interests of the Muslims. The modern secular state of Turkey is the direct inheritor of the air force of the Islamic State, making Turkey’s Air Force one of the oldest in the world. What does the Turkish regime do when Muslims are killed in the neighboring lands of Iraq, Lebanon, and the occupied lands in Palestine and Israel? What do the puppet regimes of the other Muslim nations do when Muslims are attacked and killed in their own lands? In the absence of the Islamic State, how far are the Muslims behind in nuclear technology, submarine technology, satellite surveillance, and other technologies critical in the defense of Muslims? Only a state lead by a sincere Muslim leader, the Khalifah, loyal to Islam and Muslims can utilize the resources of the Muslims to protect them and to advance them. And it can only come from the establishment of the Islamic State.